It’s the summer. And we all know what that means – party time! 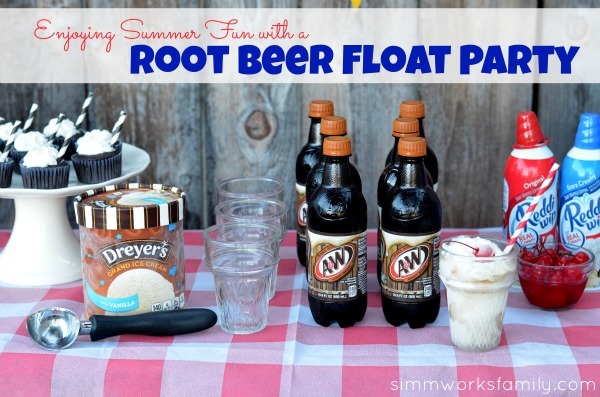 If you’re looking for a great way to celebrate summer and try out all of those tasty ice cream recipes you are seeing consider hosting a root beer float party. 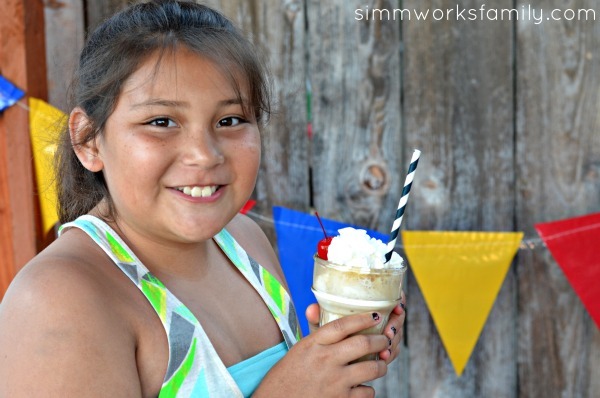 With warm days and cool nights the weekends of summer are perfect for enjoying the classic root beer float and the gorgeous weather summer brings. Since my mom is in town visiting we hosted a root beer float party and invited her and our other extended family members down to enjoy the fun. And I couldn’t wait to use the adorable ice cream cone cups I picked up at a local discount store. Most barbecues are filled with tasty goodies but these summer favorites might not always be the best choice health wise. 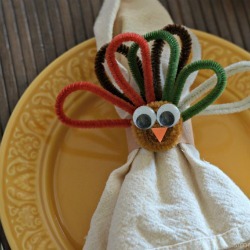 So I changed up my menu a bit and made a few healthier dishes to sub for our party favorites. In an effort to stick with my goal of staying healthy and losing weight I made a few minor changes to our barbecue menu. The turkey bacon burgers were simply pre-made turkey burgers from the store with turkey bacon and light cheddar cheese on top. 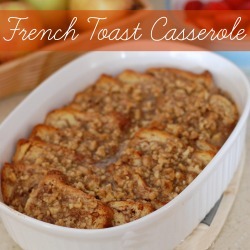 Super simple but very tasty! And less fat than a beef patty. I’m pretty sure I turned my mom into a turkey burger convert! With most summer barbecues we find ourselves faced with heavy, filling sides like potato salad, macaroni salad, and pasta salad so I decided to lighten things up and served this delicious watermelon feta salad instead. Not only are watermelons in season right now, they’re sooo good paired with feta and basil! Now the mixed greens, hot dogs and corn on the cob were easy additions that rounded out the meal. 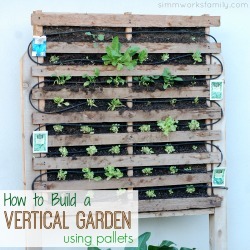 We served some veggies with a yogurt ranch dip that we picked up at Walmart to munch on before our meal. No need for heavy appetizers because we were saving room for dessert! After our delicious meal it was time for dessert! 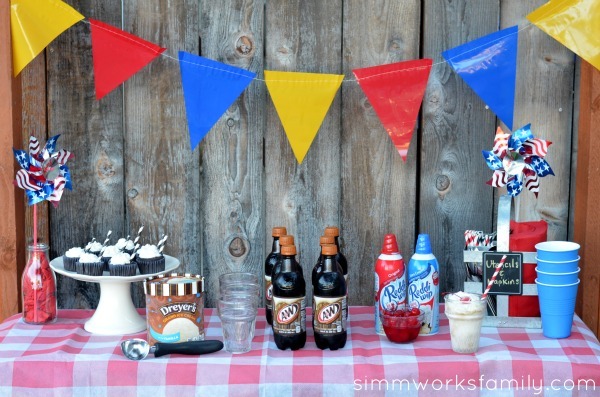 And what better to serve on a hot summer day than a root beer float bar with all of the ingredients and toppings set out for the guests to serve themselves. With the combination of vanilla ice cream and a creamy root beer we had the highest quality ingredients for the perfect root beer float. The guests loved them! And you can easily add more great ice cream toppings to your table to put your floats over the top. Since it was a root beer float party I couldn’t resist making cute little root beer float cupcakes to go along with the root beer float bar. They just fit the theme perfectly. 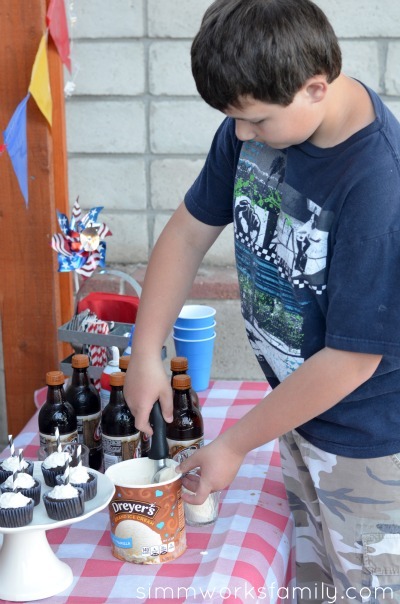 Root beer float parties are the perfect way to celebrate many summer occasions. 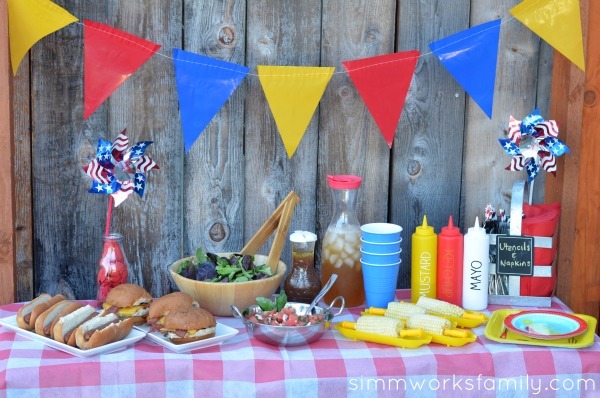 If you’re looking for an interesting spin on 4th of July or Labor Day or simply have a birthday to share, guests love being taken back to their childhood with this favorite. 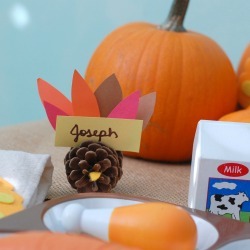 I was able to easily put together this party with the help of the fabulous inexpensive decor found at various retailers. A checkered tablecloth, some pinwheels, and other barbecue decor helped set the stage for our party and create a gorgeous spread. By including a mix of plastic and glass cups for our floats I was able to safely serve the kids as well as the adults without worrying about anything breaking. And I couldn’t wait to try out the ice cream cone glass cups I found a few years back! They fit the theme perfectly. If you’re watching your weight or trying to cut back on your soda consumption like I am you don’t have to forego the root beer float! With reduced calorie soda and lower fat ice cream varieties you can enjoy a lower calorie and lower fat option that fits your plan. And if you choose to serve the lighter fare menu I outlined above there’ll be no need to worry about your waistline at your next get together! Many classic flavors of summer can easily be created in a healthier, more figure friendly way. 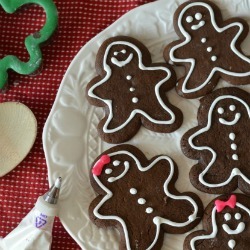 You just have to be a bit creative and try out new recipes! Another great flavor combo for your party would be the classic taste of a 50/50 bar in your glass. It’s super simple. Just grab some orange soda, vanilla ice cream and your favorite cup. 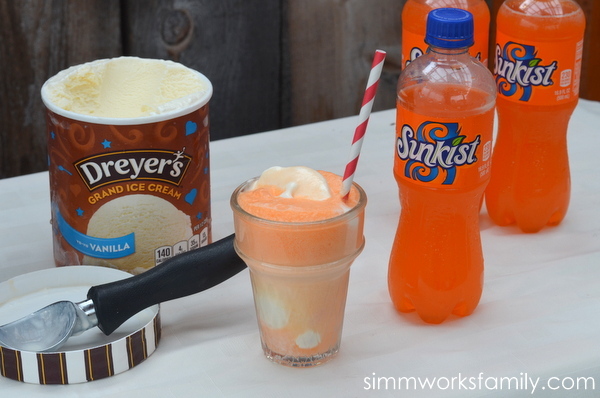 Pour the orange soda over the ice cream and stick your straw right in. Mmmm! Top your floats off with some tasty ice cream toppings and you’ll have one heck of a sweet treat. 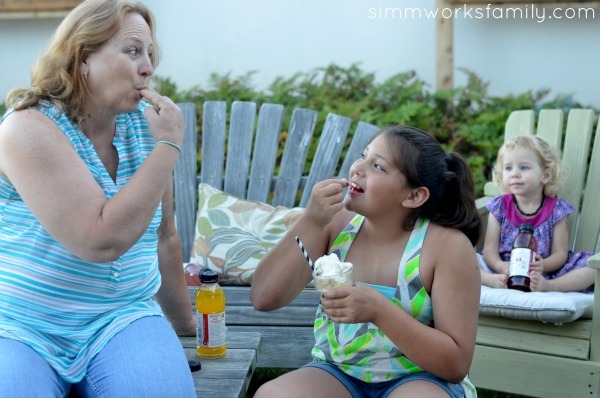 What favorite summer recipe would you like to lighten up?